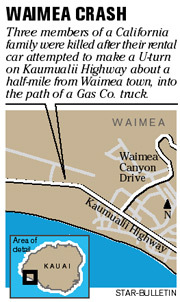 WAIMEA, Kauai » An ill-timed U-turn just outside the sleepy former sugar town of Waimea has left three members of a family dead and one in critical condition, after their rental car was broadsided yesterday by a Gas Co. truck. One surviving son is at the Queen's Medical Center in critical condition, police said. The Irvine, Calif., family, including the mother, father and two sons ages 5 and 7, have not been identified because the father had two valid California driver's licenses with different names, police said. A family member from the mainland is flying to Kauai to confirm the identity of the family, police officials said. The family was staying at the Kauai Marriott Resort and Beach Club in Lihue. According to Kauai police, the rental car was attempting to make a U-turn on Kaumualii Highway about a half-mile from Waimea town at about 10 a.m. yesterday. The midsize rental car had pulled onto the shoulder, and then it veered into the path of the truck, which broadsided the vehicle. The mother died at the scene, and the father died at Kauai Veterans Memorial Hospital. One son died while being transported via air ambulance to the Queen's Medical Center. Police could not say whether the elder or younger son survived. The Gas Co. driver was treated for back pain and shock at KVMH and released. Kaumualii Highway was closed for almost three hours as police investigated the accident.